Jim and Amanda from Australia returned to Thailand on another fishing holiday this time combined with a honeymoon at various locations throughout Thailand. The anglers chose to stay in a luxury hotel in Bangkok and make the return trip each day to Ratchaburi. On arrival at the lake the anglers began fishing with lures and were soon catching Pacu and Alligator Gar throughout the early part of the day. In the afternoon a change of fishing tactics saw the anglers fishing with live baits under large floats in the central part of the lake. After several aborted takes, Jim managed to set the hook into an unseen predator which caused an explosion out in the lake as the fish breached the surface. With a large dorsal fin protruding from the lake it was clear Jim had hooked one of the large Chaophraya Catfish as it powered off across the lake. A fifteen minute battle followed before the large Chaophraya Catfish was brought to the net. 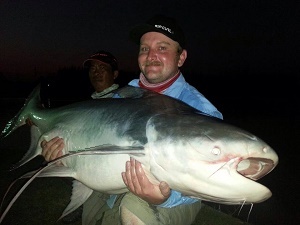 The Chaophraya Catfish was estimated to weigh 45-50 kg’s and was released after a few pictures.